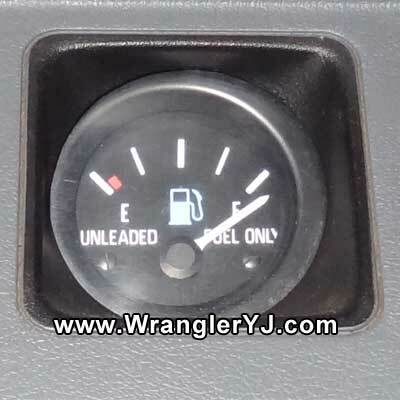 From 1991-1995, Chrysler offered two different sized gas tanks for the Jeep Wrangler. One was a 15-gallon and the other a 20-gallon however, these two tanks were not different in size at all. The difference in some was a plastic vent hose that extended down into the tank which tricked the gas pumps and prevented more than 15 gallons of fuel being filled into them. By shortening this hose, the tank can hold the 20 gallons of fuel it was originally made to carry. 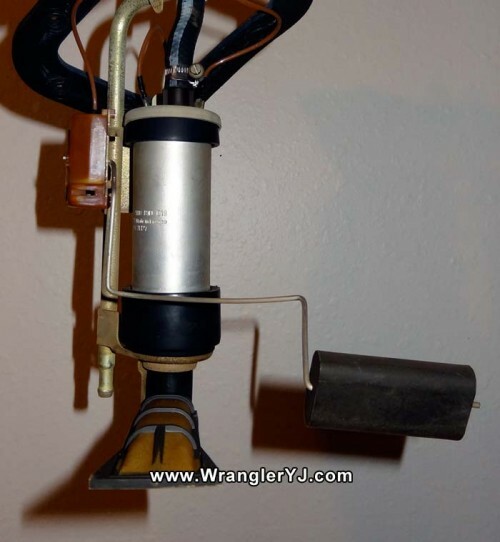 This entire conversion process is about a 60-90 minute job and can be performed without removing the gas tank from your Jeep. Apologies in advance for the poor quality of some of these images. They were taken in the 1990's with a Casio QV-10. Hi-res pix are farther down. 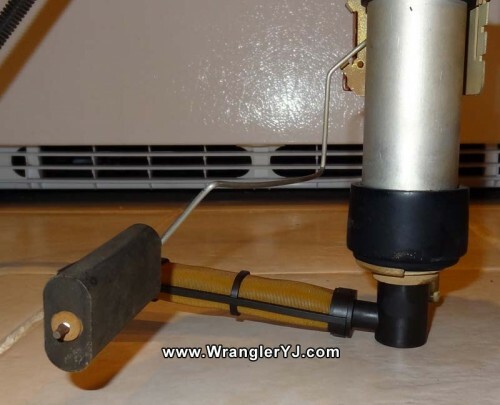 Put the Jeep on a jack stand. This goes without saying! 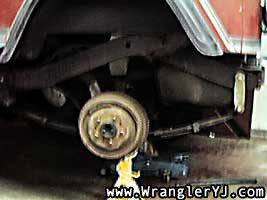 Begin by raising the left rear of the the vehicle on a jack stand and removing the wheel. Remove the plastic panel in the rear corner. This is held in place by four plastic rivets. Three of them are visible in the picture. The fourth one is not hard to find. Remove the rivets by securing the outer portion in place while prying the center outward 0.25"-0.5" with a small screwdriver. The rivets will remove as whole pieces. Don't damage them because they're needed for reassembly. 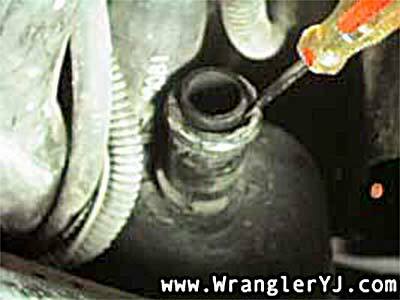 Disconnect the fill vent hose from the tank. 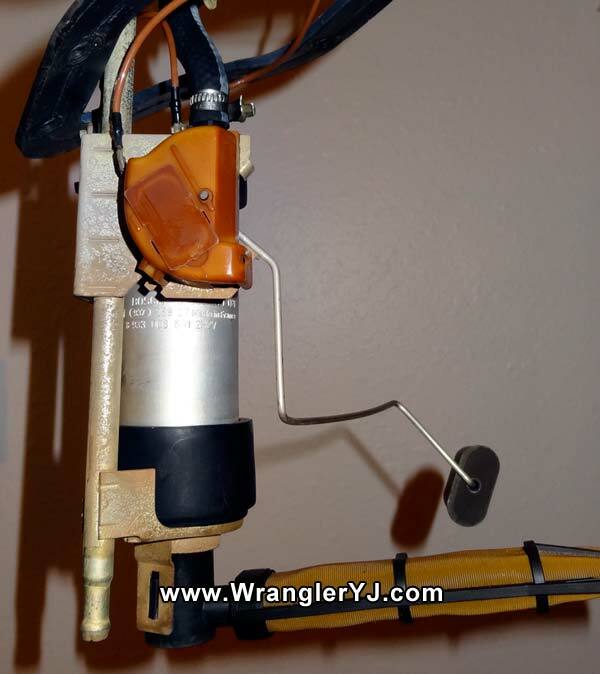 This is done by removing the hose clamp and pulling the hose off the fill vent neck. 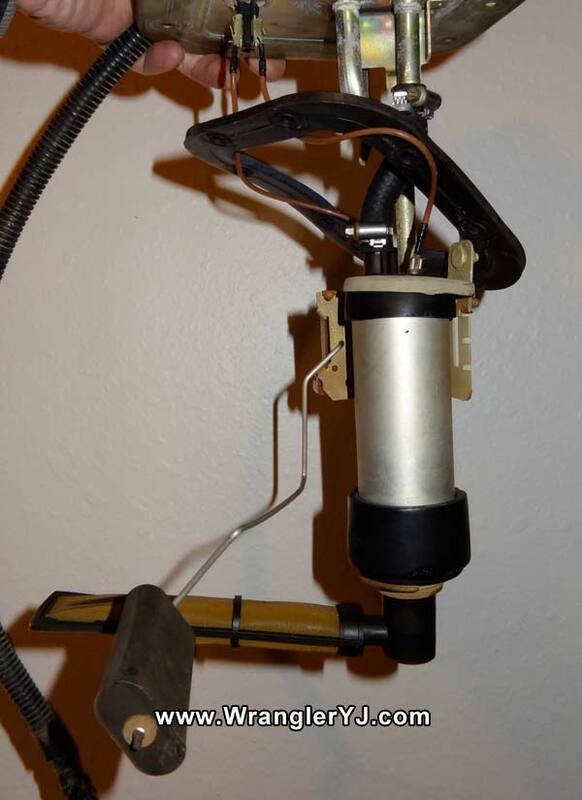 You may need to pry it, but it's only held on with a hose clamp. 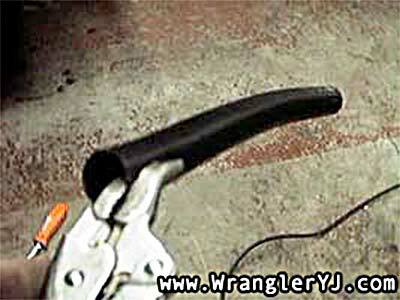 Remove the inner plastic fuel vent neck liner. Inside the neck of the fuel vent hose, you can see a tube which lines the inside. This liner tube is made of hard plastic. 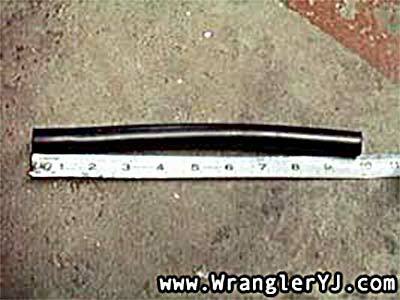 It's about 9.75" long and reaches about 7" into the tank. Gas can not be filled beyond the bottom of this tube. Shortening it will raise the fill level of gas that will fit into the tank. 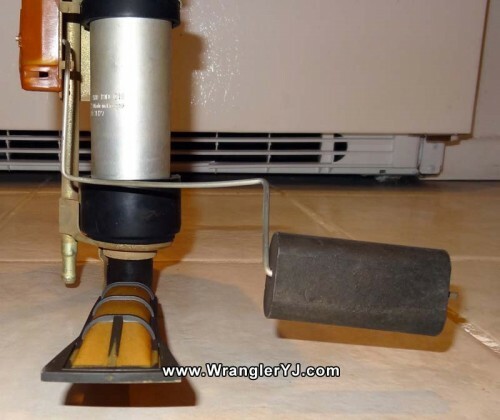 To remove it, you will need to pry it away from the sides with a small screwdriver and grab it with any small tool that offers a STRONG grip. A needle-nose vise grip is recommended (see next photo) because this tube is crammed in there TIGHT. In fact, removing this tube was the hardest task on this project. Some people removed this tube in sections by pulling out 3", then cutting it off, and pulling another 3" until the tube was completely removed. 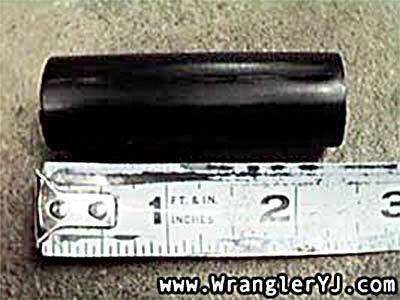 After the liner tube is fully removed, you must have at least one piece of it that is about 2.5" long to be reinserted. Cut a 2.5" section from the liner tube. 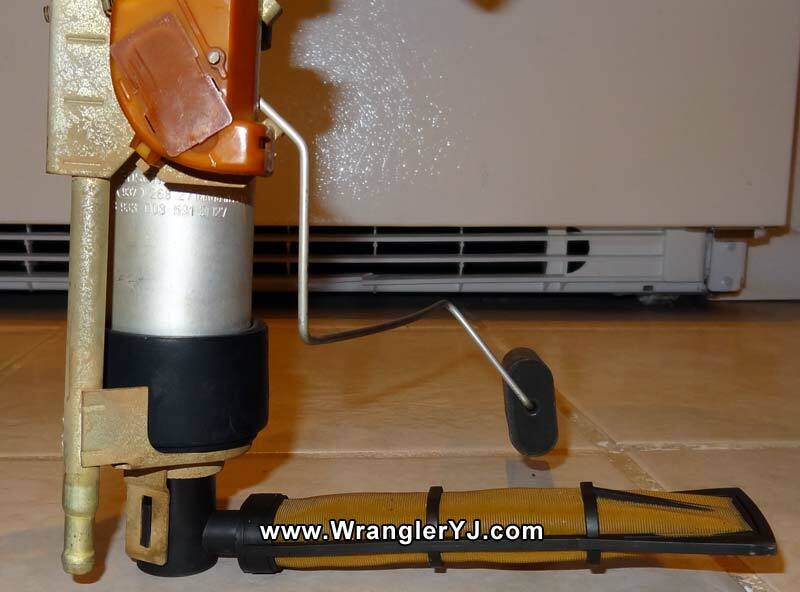 The fuel vent neck on the tank must have a section of the liner tube pressed back inside to maintain pressure applied when tightening the hose clamp (during re-assembly). Cut a 2.25"-2.5" section and fit it back into the fill vent neck. You'll need a hammer or something heavy to pound it in. Use the hose clamp to attach the fill vent hose to the fill vent neck, four rivets to reattach the plastic cover on the rear panel, and five lug nuts to mount the removed wheel. The photos above were all taken in the late 1990's with a Casio QV-10 digital camera so apologies for the poor image quality! 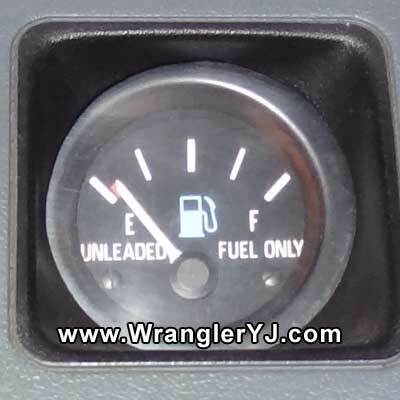 Unless you've installed a sending unit for a 20 gallon tank, the fuel gauge in the dashboard will be inaccurate. 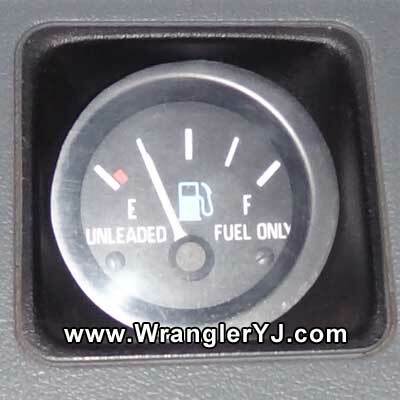 Some people who have done this conversion reported that the gauge won't begin to show movement until there is 15 gallons in the tank. 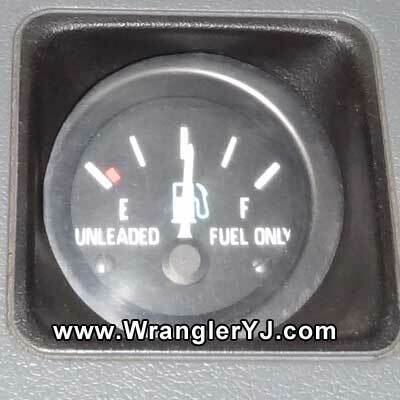 In this particular write-up, the fuel gauge did not show movement until 10-12 gallons remained in the tank and when the gauge read 1/2, the tank was near empty. 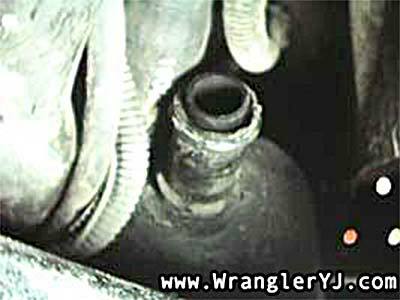 In addition to the sending unit being the wrong part for the job, there's another potential problem that can be responsible for an inaccurate fuel reading. At the bottom of the fuel tank is a plastic trough that is responsible for trapping fuel to prevent fuel starvation when the fuel level gets low. 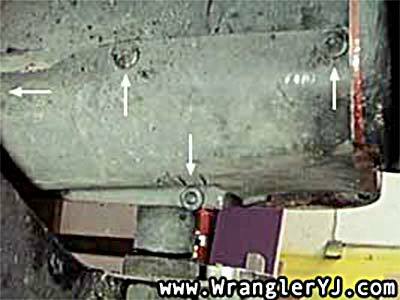 It's not uncommon for the walls of this trough to warp over the years and if they warp outward, it can prevent the fuel sending arm from being able to drop down to the bottom of the tank. There is a way to sort of "fix" this problem which does not involve spending $100-$200 on a new sending unit. 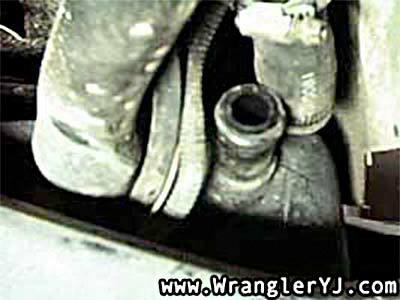 It will, however, involve removing the gas tank and removing the sending unit to bend the sending arm in such a manner that it will give a more accurate reading on the fuel gauge. There is no specific way to describe this process, but the idea is to bend the zig-zagged sending arm outward and forward. 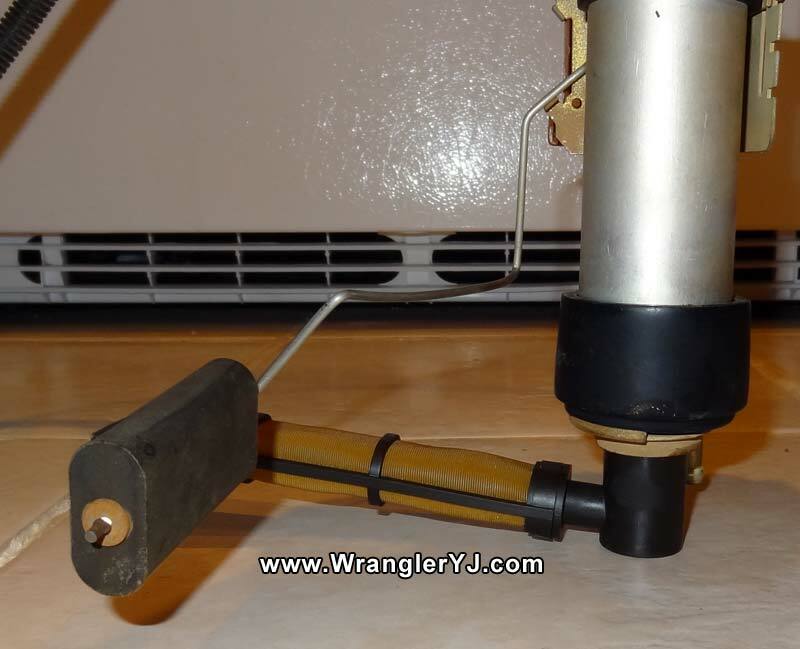 This gives it a greater "reach" allowing it to more closely reach the top of a full tank, and also not get caught up on the trough as it drops to the bottom of the tank. The best way to complete this is to review the following photos (which ARE in high quality) and bend your sending arm to best resemble what you see. The photos were taken from several sides to give the most perspective for bending your own. The gauge indicated FULL until 8-10 gallons had been consumed. 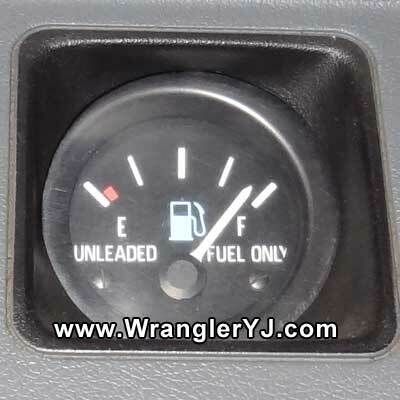 The gauge originally indicated 1/4 when the tank was empty. The gauge eventually indicated 1/2 when the tank was empty. 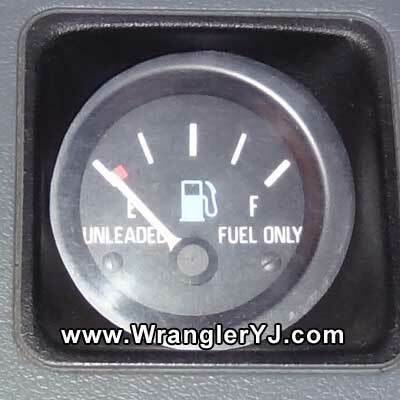 In other words, the gauge always indicated FULL until it was about half gone, then quickly dropped to 1/2, at which point it was time to refuel. The new fuel readouts are a huge improvement and something important needs to be said. 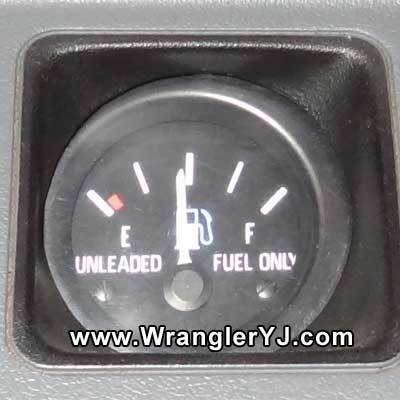 To get these fuel gauge readings, the fuel tank was first removed and all gas completely drained. 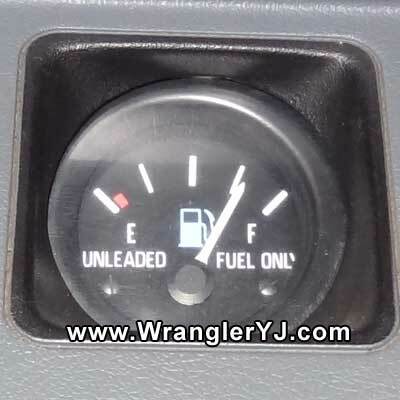 Using four 5-gallon gas cans (each of which had been filled to exactly 5 gallons according to the Shell gas pump), fuel was then added to the tank in 5-gallon increments and the engine was briefly turned on to take a photo of the gas gauge. All 20 gallons went into the tank with no spillage or overflow so it's possible that the tank may be able to hold 20.1 or more gallons. 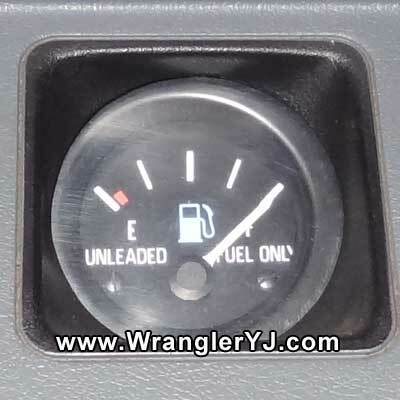 Assuming however that 20 gallons was the max, the Jeep was driven until the fuel gauge was at the red mark at which point it was filled up at another Shell station with 18.47 gallons, hence it is assumed that the red mark indicates that 1.5 gallons remain in the tank. Whether that's 100% accurate or not isn't important. It's just nice to have a working fuel gauge to indicate when to fill up and not rely completely on the odometer for the next fill up. FULL tank with the engine running. FULL tank with the engine stopped. 15 gallons with the engine running. 15 gallons with the engine stopped. 10 gallons with the engine running. 10 gallons with the engine stopped. 5 gallons with the engine running. 1.5 gallons with the engine running. 1.5 gallons with the engine stopped.